Patti Tingen is an award-winning author and speaker, bringing the message that we all have value and purpose. Patti's illustrated children's book, A Cat Named Mouse. has won a 2016 Readers' Favorite International Book Awards Bronze Medal and a 2016 Purple Dragonfly Awards Honorable Mention. A God for All Seasons: Inspiration and Reflection for All Times, has won several awards including the 2015 Feathered Quill Book Awards Program Bronze Medal for Best Inspirational, a 2015 New York Book Festival Honorable Mention and the 2014 Readers' Favorite Silver Medal for Christian Non-Fiction. Patti's hope is that her words of personal experience, humor and testimony will continue to bless and inspire others. A Cat Named Mouse by Patti Tingen is the endearing story of Mouse the cat, Cheese the mouse, Cat the dog, and Cow the horse. Each one laughs at the other one's name but then the irony is that everyone's names are mixed up, making them look silly and funny. It is a theme that is relevant to the requirements of a child's growth in current times. The author covers the topics of bullying and teasing which many children face in their school and neighborhood. The author tells readers to be more tolerant and understanding toward their friends and the people around them. They should be helped to cope with these kind of acts. By the time the story ends, readers can see how the cat, dog, mouse, and horse become good friends. The theme is very simple, but the author has managed to convey a strong message with her words. The scenes are clear and can be easily comprehended by children. Many of them can relate to the incidents put down in the story. Acceptance in society and school is very important for the healthy growth of children. The book initially shows the teasing and bullying scenes and how finally the cat, dog, mouse, and horse overcome that by extending a hand of friendship. Books with a concept are ideal for children. This conveys the message in the form of story telling. Parents and teachers can use this story for read-aloud sessions in libraries and classrooms. What a wonderful book for young readers to help overcome teasing. Thank you Patti for another wonderful book. I can't wait to share with my granddaughter! What a neat children's book which has a "real" lesson on bullying and friendship. The animal characters are adorable and learn to accept others with differences. It would be a great read for preschool, kindergarten and probably older children. The rhyming by the mouse adds another dimension to the story that I liked. I loved this little book! A Cat named Mouse a charming book for youngsters with a great big ole lesson that ages 2 - 100 can learn from. The caricatures on these pages are so wonderfully drawn and I'm sure it will hold the attention of even the littliest of souls. The message in the story is so important and is told in a way that is understandable and clear. Patti Tingen does a beautiful job of showing how words can hurt and how important it is to treat others with kindness. It also clearly displays how our 'differences' can actually bring us together. Kudos for a smartly written and wonderfully illustrated childrens book! I absolutely love this story ! It is wonderfully illustrated with adorable animals children will love, and short rhymes teaching, about friendship. I appreciate the messages about self acceptance, and how respecting others, can lead to some great friendships, Patti has presented in such a fun way. I highly recommend this book, for everyone it would be a great addition for your child's bookshelf ! Wonderful acceptance book to help chlidren realize that people are not the same, and we, as children or adults, need that reminder to accept them whoever they are. A CAT NAMED MOUSE is a delightfully charming story with a sweet moral in the end. Children will enjoy the silliness of the mixed up names and the gentle rhymes and repetition in this book. They will also relate to the bullying issues the characters face and the tender moments at the close of the story. I liked the special attention given to the shapes and sizes of some of the words in this book, as these could be parts a younger child might read or say. The ending caused me to smile and sigh contentedly, as the characters all had learned from their own experiences and found happiness. The book was very well written. Patti Tingen is definitely gifted as a children's author. The artist's drawings are absolutely precious and match the personalities of the characters so well. What a beautiful blend of artwork and literature! I would definitely recommend this story to parents to read to their children, as I'm sure it will become one of their favorites! A cat named mouse, a mouse named cheese and a dog named....guess what? Patti Tingen's "A Cat Named Mouse" is an adorable story that will keep your children focused and entertained. Your little ones will learn why some animals bully others and how you can turn enemies into friends. It's a simple story with a profound message. It's also full of humor, my favorite line being "I'm pleased I didn't eat you". Where children’s books are concerned, I am a fan of stories that are simple and easy to read, words that rhyme, verses that dance on a melody and easily roll of the tongue, colorful imagery, and whimsical characters. This book delivered on all counts! Also, the artwork in this book is fantastic. I just love the shading and shadows, the blending of hues, and the character expressions. I loved the story line and laughed out loud more than once. But I especially love the story’s message. In a world where bullying is an ever increasing phenomenon, it’s refreshing to read a kid’s book with good old fashioned values. This book speaks of kindness, friendship, and community. Bravo! I’m ordering a copy to send to our newest Grandbaby. She’ll love it as much as I do. I'm not generally big on children's books, but this is a winner! Beautifully illustrated, and with witty rhyming prose, this is just purrrfect for children for any age, and for many adults I suspect! Well done, Patti, this is a simple story with a very powerful message for our times - what's in a name, just respect the differences and we can all be friends! 'A Cat Called Mouse' is a picture book for young children, which explores issues around friendship and self confidence. I was offered a pre-publication e-copy in exchange for an honest review. As an e-book it reads best in 'full screen mode'. The pictures are so much part of this story, that full screen helps to view the words and pictures together to the best advantage. If you would like a copy, I really would recommend buying a paper version, so that you can share and enjoy more easily. The story is strong, easy to understand and well thought out, and the pictures complement it beautifully. In the gentle, make-believe world where cats talk to mice and dogs, we learn that names are not unusual or 'wrong' unless we make them so. I wish that more of us humans could learn that lesson, which is so simple, yet so important. 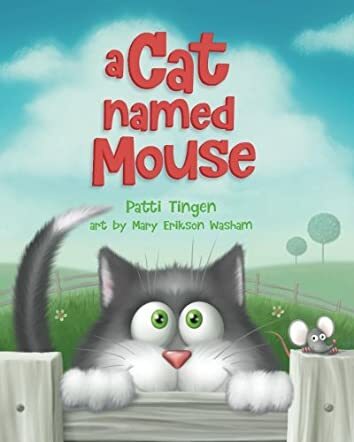 A Cat Named Mouse, written by Patti Tingen with art by Mary Erickson Washam, is a charming story about just that -- a cat named Mouse, as well as a mouse named Cheese and other seemingly misnamed characters. As our story begins, we meet Mouse who has just moved into a new neighborhood. Anxious to find his new best friend, like any adventurous cat, Mouse approaches the dog next-door. But it turns out that the dog is something of a bully. He laughs at Mouse and makes fun of our poor cat, who returns home sad, confused and even lonelier. Not too long after, however, Mouse meets Cheese, a very smart little mouse. The two become friends, and Cheese teaches Mouse some important lessons about bullies and bullying. Patti Tingen is best known for her award-winning inspirational books and talks for adults. In her first children's picture book, she proffers her message of acceptance and appreciation for everyone, while illustrating how bullying is hurtful and, perhaps more importantly, can cause a cycle of bullying. In A Cat Named Mouse, Ms. Tingen teaches young children about the value and purpose of each individual and the importance of understanding and acceptance of others and ourselves. She accomplishes this without being didactic but rather by engaging and maintaining a preschooler's attention with an entertaining story. What I like best about this book is the creative way Ms. Tingen teaches complex lessons in a simple, comprehensible story appropriate to preschoolers. What I like least about A Cat Named Mouse is how quickly Mouse and Cheese become friends and Mouse learns the lessons being taught. I recognize that, given her target audience, Ms. Tingen needed to keep the story succinct, but I don't think another page or two would be detrimental.